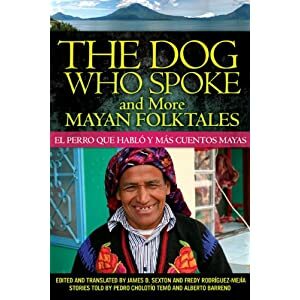 This is an engaging collection of 33 tales from Lake Atitlan, a rural area of the Guatemalan highlands in the southwestern part of the country in which the oral culture plays a vital role in people’s lives. Each story is presented first in its English translation followed by the Spanish version. The Spanish version is not a literal transcription of the original Spanish version as told by the two storytellers. Rather, the editors have used a translation technique known as “free translation” which allows for local colloquial expressions to be changed to more standard Spanish, and which allows for verb tenses to be changed for consistency within the story. There are stories familiar to Latinos in the southwestern U.S. but with local Guatemalan twists, such as the story of “La Llorona”; human transformation stories such as “Three Men Who Turned into Characoteles” (characoteles are people who can alter into their spirit forms and perform evil deeds; cultural reinforcement tales such as “King Solomon and the Bee”; and there are stories that are just plain funny such as “The Man Who Defeated the Devil”. The tales will appeal to academics and to general readers alike. The editors are highly qualified academics who provide an historical and anthropological perspective to the material. James D. Sexon is a professor of anthropology at the University of Northern Arizona and Fredy Rodriguez-Mejia is a doctoral student in anthropology at Michigan State University. The first 34 pages of the book provide a cultural and historical context for the stories. In addition there are extensive notes, presented both in English and Spanish, which provide in-depth and explanatory information. The glossary and list of references add to the enjoyment and understanding of the stories. Unfortunately the book contains no illustrations and therefore it is not “storytime-ready”. Nevertheless, the book contains many stories suitable for children that a creative storytime performer will be able to adapt and use.